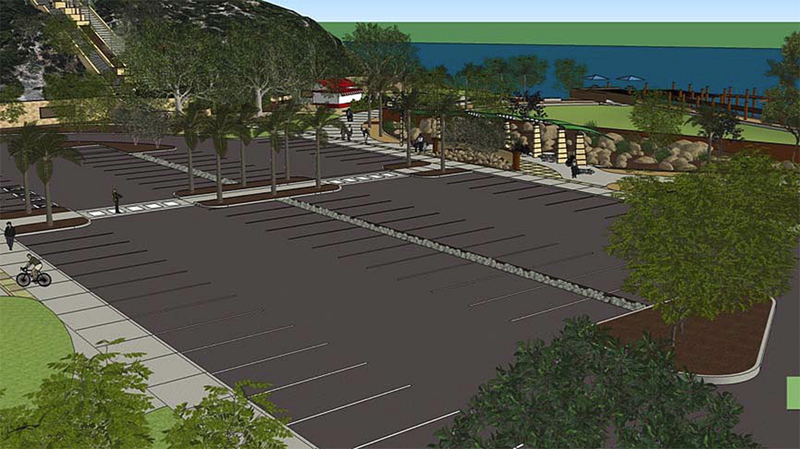 Newport Beach — A grand staircase running from Upper Castaways to the Lower Castaways parcel in Newport Beach, Calif., was only one of the ideas Harbor Commissioners discussed on ways to revitalize the four-acre site. The connecting staircase, which would hypothetically be used for walking and viewing on one side and jogging and other exercise on the other, was presented by Harbor Commissioner David Girling who leads the Lower Castaways subcommittee. At the March 12 meeting, exactly one year after Lower Castaway’s first study session was held; Girling provided the public a detailed look at the land as it stands today and the culmination of several community ideas on how to develop it. Aside from the grand staircase, a boat launch, an L-shaped dock, park, a biking and hiking hub, a marine waste disposal facility, water taxi base, a community garden and 80 to 90 car parking lot are some suggestions for the site. The parcel is currently zoned as a commercial marina, must be rezoned, for recreational use. As it currently stands, the project will require approvals from several regulatory agencies, such as the California Coastal Commission, City Council and the California Department of Fish and Wildlife. The land is currently a Marine Protected Area (MPA) which protects against any development or use that would kill wildlife, Girling explained. “Our only solution is to get in front of the Department of Fish and Wildlife and let them know what we’re doing, if we state our case there is a good chance that they’ll be sympathetic,” said Garry Brown, founder and president of Orange County Coast Keeper. “There’s going to be probably unnecessary push back. I think a lot more groundwork must be done, not only with the commission, but with other people that are stakeholders. “I think it’s doable but it’s going to take some effort,” Brown added. The decision to put the MPA on Lower Castaways wasn’t based on science, Brown explained. There were other factors. Political negotiations between fishermen of Newport Bay and conservationists determined Coast Highway bridge an iconic boundary. The north side of which now prohibits the changing of anything that would impact the bottom sediment and habitat below mean low tide. Such changes would include pilings and launch ramps, Brown noted. Girling noted that the city would like to utilize the natural land as well as preserve existing things like the fichus trees. The renderings will be presented to Tidelands Committee on March 19 and to the Parks Beaches and Recreation Commission on April 1.